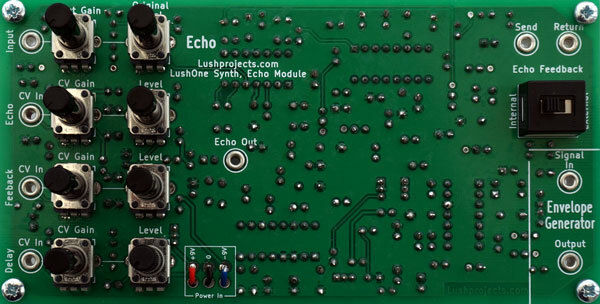 The LushOne Echo module provides highly flexible delay and echo effects. All key parameters can be set manually or manipulated using a control voltage. With the LushOne echo you can simulate room echoes or create space-age effects. The LushOne Echo also contains an envelope generator which produces a control voltage based on the amplitude of the input signal. The LushOne Echo kit continues the design principles of the LushOne base. A single board design is used to keep costs low. The LushOne echo uses the popular PT2399 digital delay chip with supporting analogue circuits. The PT2399 is a really fun chip. At long delays it gets noisy and creates a lo-fi roughness to the sound. At medium and short delays it has a nice, natural quality. The ability to vary the delay on-the-fly and with a control voltage allows it to create space-age swoops and zaps as well as more normal static delay effects. The LushOne Echo can be added to any level of the LushOne system. It can be used with just the LushOne Base or integrated in to a bigger system. The audio sample below shows how even with just the LushOne Base and LushOne Echo you can create some amazing sounds. Single board design including all controls and connectors (except power-in) providing straightforward construction and neat presentation. A laser cut case is available that contains the LushOne base and the Inca or it can easily be housed in a project box. The LushOne Echo is straightforward to build but it does have quite a high component count. It is recommended that you have some experience in building electronics before starting on this kit. All sounds are recorded directly off the LushOne live with no post processing (except fade in/out). Musical echo - use of echo to create a sustain effect on a piano sound created from LushOne base and LushOne contour. First played with the echo and then without.